Learn how to increase system and on-line security. Use open-source tools to dump and scan RAM from a target system for encyption keys and other goodies. 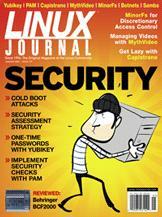 How to implement Linux security checks. Four checks for a more secure network. A set of user-space filesystems for enhanced discretionary access control. Using Darknet to secure environments from threats in the wild. Marcel Gagné's Cooking with Linux Evil Agents under the Bed and Other Scary Things that Go Boom!